The Wise Builder (not visible) inside his red stone home on the rocks. 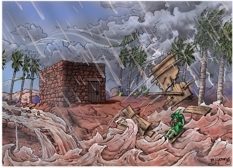 The Foolish Builder, dressed in green, being swept away with his house by the storm surge. This is the fifth scene in this series of 6 that tells the parable (story) of the Wise & Foolish Builders. Finally the disaster has struck! 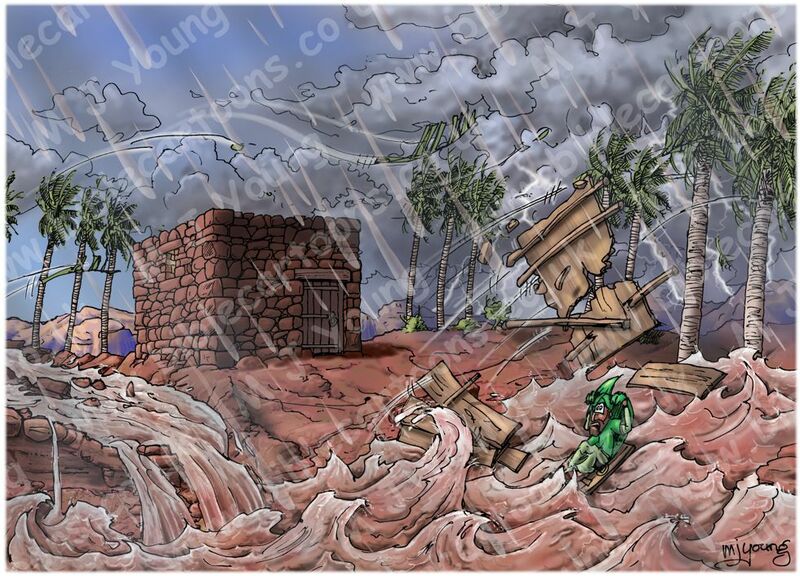 The Foolish Builder is being swept away, along with his wooden house, in the torrential rain & storm surge waters. Notice he is sitting on the front door, like a life raft! The Wise Builder is sensibly inside his stone home – safe & snug from the wind & rain. I really enjoyed drawing & colouring the surging, turbulent flood waters, including the local red sandstone colour in their murky depths.